Animal mesh net sponge- Dog mesh net sponge , it is a very good item for child shower , mesh net sponge can enrich foam and lather ,animal is lovely shower toy for child . To use:Apply favorite bath gel and lather.Rinse and hang up to dry after use . Care instruction:Do not use on irriated,damaged or broken skin.If irritation develops,discontinue use immediately. A: Our factory is located in NINGBO City, ZHEJIANG Province, China, about 3 hours bus ride from Shanghai . warmly welcome to visit us! A: 1) We are glad to offer you free samples for quality approval ,but the freight will be collect ! 5. Q:How does your factory control the product quality ? A: Quality is the life of company , we pay great high attention to quality controll ! 1. 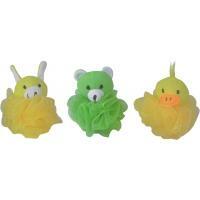 We are Leading Bath Accessories Personal Therapy Care Products Manufacturer In China ! 4. Your satisfaction is our pursuit. If there is any question about our product, shipping, package etc. Pls do not hesitate to contact us. We will try our best to solve the problems. Your inquiry will be highly appreciated ! Wish can establish long-term mutual beneficial business relationship at early date , please feel free to contact us, we will do our best to serve you !